The Oakland Unified School District has hired Lance Jackson as the interim head of the Division of Facilities and Management Department at the cost of $30,000 a month. Depending on how long the district takes to conduct a national search for a new administrator to oversee OUSD’s school bond-financed construction programs and repairs, maintenance and custodial services, the cost would total $360,000 a year – more than the $280,0000 a year earned by Supt. Antwan Wilson. Tim White, who was forced out of his position in February, earned about $13,000 a month when he left the district, roughly $156,000 a year. “Lance is earning $30,000 per month, which equates to $360,000 annually, although it’s unlikely he’ll remain in the position for that long and the contract was not designed with the idea that Lance will remain as interim head of facilities for a full year,” said district spokesman Troy Flint in an email to the Post. In addition, the Post has learned that Jackson and his company Seville Group Inc. (SGI) are responsible for planning and design management of the $1.6 billion dollar construction program currently underway at West Contra Costa Unified School District, which has come under intense public criticism for mismanagement by the district’s administration. According to Oakland Unified, as Chief Operating Officer of Seville, Jackson is ultimately responsible for the company’s work in West Contra Costa. But the company is not implicated in the investigation of mismanagement, and Jackson has not been involved for five years in day-to-day oversight of construction in that district, according to OUSD. Jackson and his company have had consulting contracts with OUSD for a number of years. In the 14 years that Tim White worked for the school district, he was in charge of expenditures for school bond Measure J, $475 million; Measure B, $35 million; Measure A, $330 million; and before that Measure C, $169 million. He also brought in $300 million in state matching funds. Seville Group, Inc., founded in 1994, provides program, project, and construction management services for public agencies in California. Its projects include facilities, such as K-12, higher education and municipal facilities; infrastructure projects, including water, wastewater, power, and highway projects; and transportation projects. “He is responsible for planning and design management of the billion dollar construction program currently underway at West Contra Costa Unified School District and is also providing executive oversight for the East Side Union High School District’s new construction and modernization programs and the Oakland Unified School Districts Measure B Bond Program and Capital project,” according to the website. In a strongly worded editorial last Sunday, the Oakland Tribune called on the West Contra Costa’s Board of Education to fire Supt. Bruce Harter for mismanagement of the district’s $1.6 billion school construction bond program. Harter should resign, and if he does not, the board should fire him, according to the Tribune. Obtaining “basic information such as square footage construction costs is nearly impossible. A 2013 audit dinged the district for disproportionately spending on architectural, engineering and management costs rather than direct construction,” the editorial said. March for Schools Oakland Students Deserve is just 2 Days away! 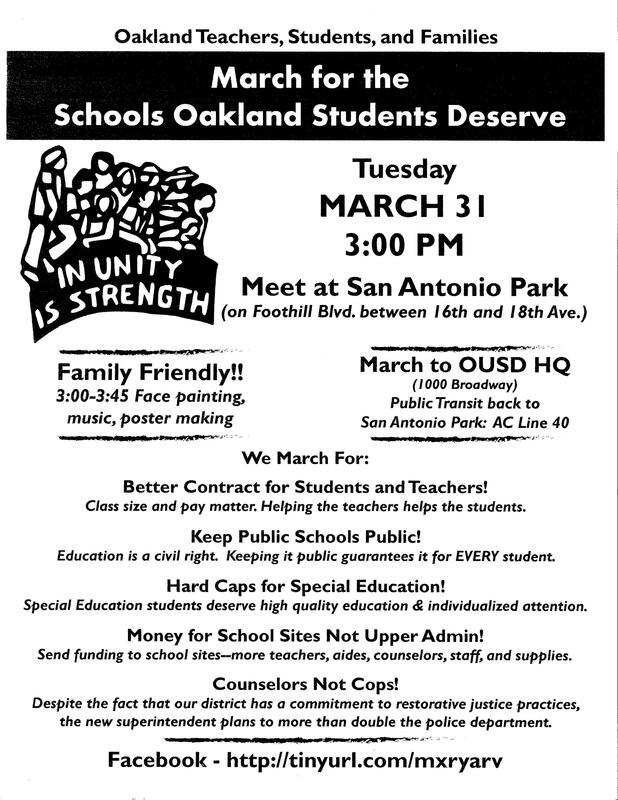 The March for Schools Oakland Students Deserve is on TUESDAY March 31st! Join a coalition of Teachers, Parents, Students and Community members at San Antonio Park at 3pm on Tuesday for family friendly activities and speakers. Slated to speak are Federico Chavez, Administrative Judge and nephew of Cesar Chavez, and noted Civil Rights Attorney Dan Siegel, plus Teachers, Parents and Students from across our District. We will then march at 4:30 to the Downtown offices of OUSD at 1000 Broadway. Invite friends, family, neighbors and co-workers to this Event and join the movement! Join us on Friday March 27th @ MetWest High School for an evening of spoken word, youth produced Black and Brown Unity art, elders, young-stars and great food!!! As we mourn and organize around the unjust killings of Alex Nieto and Alan Blueford here in the Bay Area, so many more of our Black and Brown relatives across the nation echo our cries for justice for all who have lost their lives to the violence of the Police, Border Patrol and the state. At 67 Sueños we have dedicated a year’s worth of Art, Poetry and action to the power of Black Brown Unity as a response. Our poems, art and love must overcome their guns, tasers and hate! 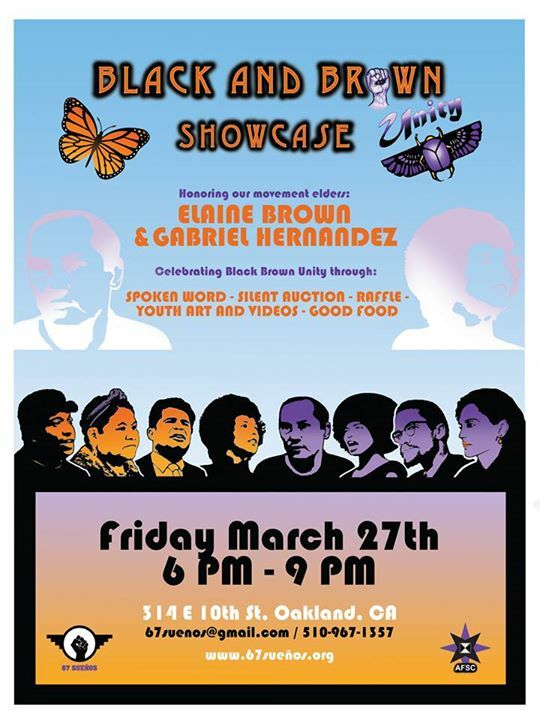 We invite our community of Black and Brown beautiful people and our staunch allies to come celebrate Black and Brown Unity, honor some of our elders, celebrate and nurture our next generation of leaders and raise the funds for 67 Sueños next summer mural project in Oakland. We need you to nurture and water the seeds that will grow to transform this hateful violent society into a place of love where Black and Brown lives don’t only matter, they are deemed precious! P.S. We will have some of the most amazing Auction and Raffle items available to help you help us. So bring your checkbook, bring a friend and bring the LOVE cuz this is our 5th generation of 67 Sueños young-stars coming of age before your very eyes on stage! $5.00 Donations will be taken at the door but absolutely no one turned away for lack of funds or $12.00 donation which includes a meal ticket. Experience Matters! Great article about the importance have retaining experienced teachers. This is especially important to read in the context of the assault on Article 12 protections for veteran teachers. Investigating the connection between a teacher’s experience and his or her teaching quality has long proved methodologically challenging, largely because of the difficulty in comparing cohorts of students taught by teachers of varied experience levels with different training and backgrounds. Studies based on such cross-sectional comparisons have tended to find few performance differences between early- and later-career teachers. Beginning in the early 2000s, scholars began to track the same teachers over time, linking them to their students’ test scores. But there are pitfalls to that type of statistical modeling, too. For one, it requires researchers to make assumptions about a typical teacher’s growth trajectory over time in order to disentangle the effects of each year of experience from other possible influences, such as a change in class size or curriculum that might have occurred. In their new study, Mr. Papay and his co-author, Matthew A. Kraft, also of Brown University, show that some assumptions in prior research have had a tendency to depress the effect of teachers’ experience on student achievement. Under all three of the models studied, the researchers found teachers’ ability to improve student achievement persisted well beyond the three- to five-year mark. While the teachers did make the most progress during their first few years in the classroom, teachers improved their ability to boost student test scores on average by 40 percent between their 10th and their 30th year on the job, the study shows. What’s more, teachers with more years of experience are better equipped to boost more than just test scores, according to a second new study, released as a working paper by the Washington-based National Center for Analysis of Longitudinal Data in Education Research. Using a value-added method similar to that of the Brown University scholars, Ms. Ladd and Ms. Sorenson similarly found that, on average, the students’ teachers continued to improve their effectiveness in boosting academic outcomes for at least 12 years. The study also found suggestive evidence of benefits to time spent on reading and homework completion. But because of statistical “noise” surrounding those findings, they are not as precise. In all, the new studies paint teacher quality as a mutable characteristic that can be developed, rather than a static one that’s formed in the first few years on the job. That’s a welcome change for the 3 million-member National Education Association, which has long maintained that teacher experience matters and should be considered in determining pay and promotions. “It isn’t that you scrap all reforms and go back to the good old days, but it’s time to look at a third way—career ladders, shortened salary schedules, hybrid teaching roles,” he said. Both sets of researchers stressed that their findings concern the average teacher’s rate of improvement over his or her career. They shouldn’t be interpreted to mean that experienced teachers are always better than novices. Oakland Unified School District it seems inappropriate for you to be posting about this proposed raise on a third party site while you are having confidential and purportedly good faith negotiations with OEA. Further, the information you posted is misleading and clearly intended not to inform but to turn support away from your teachers and toward your proposal. Isaac Kos-Read, public information officer for OUSD, explained some of the nearly $1 million in increased spending in the top tier of the Central Office this year alone by telling me that some of the positions were given an increased work load and therefore the increased salary was not a raise but merely compensating for the increased workload. In turn, Mr Kos-Read, you must agree that if a “raise” is for an increase in hours required under the contract, then it is not a raise but compensation for additional work and should not be counted as part of the “raise” you cite. In addition, the remaining 1.5% “raise” being touted here would result in a decrease in the overall benefits package, which you have repeatedly held up as being one of the best in the county (although GO Publlic Schools recently pointed out that it is below average when compared to Districts across the State with similar enrollment and complexity). So when you remove the compensation for additional work and net out the decrease in overall benefits from the “13.5%” contingent raise, it is still a 10.5% contingent raise being offered. In addition Oakland Unified School District, the reason that the raise is both the largest proposed in a decade and the largest (you say) being offered in Alameda County is because our teachers are and have been underpaid for many years, and in order to try to close the gap, you need to consistently outraise surrounding districts for some time to come. According to GO Public Schools, OUSD is between 7.6% and 15% below Alameda County average at this point in time (and 10 to 22% below similar districts across the state) which means that you need to offer that just to get even with other Districts and then keep pace with their offers year after year to stay even. I would appreciate if in future you wish to post on OUSD Parents United that you do so in a way that is truthful and not intended to mislead. Join Oakland Tech Teachers on the front lawn of beautiful Oakland Tech high school as they stage a “grade in” to highlight some of the many tasks that they perform outside of contractually required hours. Bring a sign or grab one there and show support for the teachers while raising awareness that they need a fair contract. While you are there, take a moment to sign a postcard to Mr Wilson or the Board letting them know that you support the teachers. The post cards will be delivered at the end of the March for Schools Oakland Students Deserve on March 31st! Meet at San Antonio park at 3 pm for family friendly fun before marching to the District offices. Thirty Schools signed on to March for Schools Oakland Students Deserve on March 31! Thirty schools and counting are planning to March for Schools Oakland Students Deserve on March 31st! 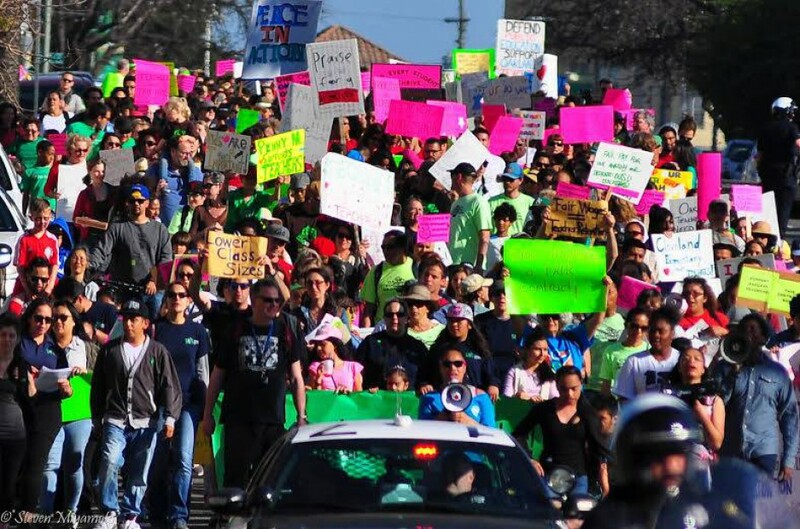 Meet at San Antonio Park at 3pm for a family friendly rally before the 4:30 march to the OUSD Offices at 1000 Broadway (then take the 14 or the 40 AC Transit buses back to the park with other families and teachers).